Clarks, the British footwear brand, has opened a pop-up shop in Neal Street, Covent Garden, to showcase it's Men's AW14 collection. It's open until 16th November 2014. The space was arranged through Appear Here. "This autumn, British shoemaker Clarks will launch its first dedicated men’s showcase. 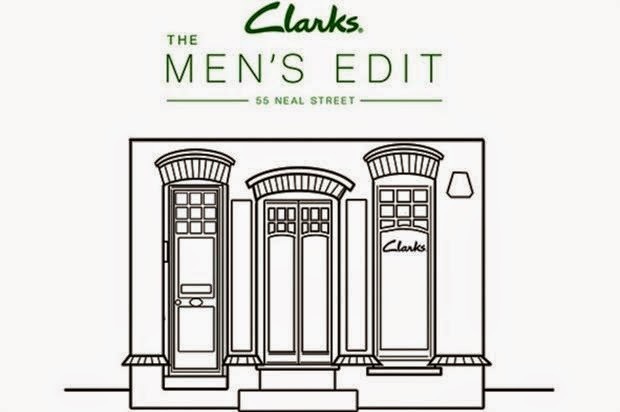 The pop-up will open in Covent Garden on 23rd October for three weeks, stocking an edit of Clarks’ AW14 men’s collection. Located at 55 Neal Street in the heart of Seven Dials, the store’s completely unique experience is inspired by the union of Clarks’ craftsmanship and contemporary design. Clarks has been making footwear since 1825 but this is the first time customers will be able to shop from a standalone men’s store – a move that marks their continued investment in design and modern craftsmanship. This is one of the many brand building activities Clarks has undertaken over the last 12 months, as the brand continues to go from strength-to-strength. Showcasing formal and dress casual styles, but in an unexpected way, the AW14 collection provides a reinterpretation of classics styles, executed in a clean, contemporary manner with an unrivalled attention to detail and quality."